Any shed built with dimensions that total less than 107.5 sq ft to be percise does not generally require a building permit (except for the city of Vancouver), as such most sheds are built with this in mind. However, the shed must still comply with local zoning and bylaws. Also most good shed builders take into consideration if the length and the width of the shed will use available lumber lengths efficiently. In are opinion, the best shed dimensions are: 8x12, 10x10, 11.5x9, 8x10, 8x8 as these sizes with the exception of the 11.5x9, maximize the use of the lumber. Another interesting size, but not very common is 13'5" x 8 as it still fits under 107.5 sq feet. Our ultimate garden shed also uses a non standard size. The following is a list of common items that we put in any given shed, you are by no means limited to this. This list is just to get you started. We encourage most of our clients to go with metal roofing because it is far more durable than asphalt shingles or cedar shakes. All of the sheds that are pre-built and delivered to clients generally uses metal roofs to keep the weight down and to allow for easy assembly. Below we are showing the most common diamond rib pattern, however there are other styles of metal roofing available. When we come out to meet with you and do a consultation we will bring a sample book with us. As mentioned above we generally recommend metal roofs to clients, because of their durability, however, we realize that the roofing on your shed matches what is on your house, so we often install asphalt shingles for clients on our sheds to match the existing shingles on their house. The shingles shown below are architectual shingles that are stronger than traditional three tabs, and give a more cottagy look to your shed. Hardie siding is a low maintenance option to traditional wood-siding. It is designed to look like regular bevel cedar siding. It does not rot, crack or split like cedar siding does over time. 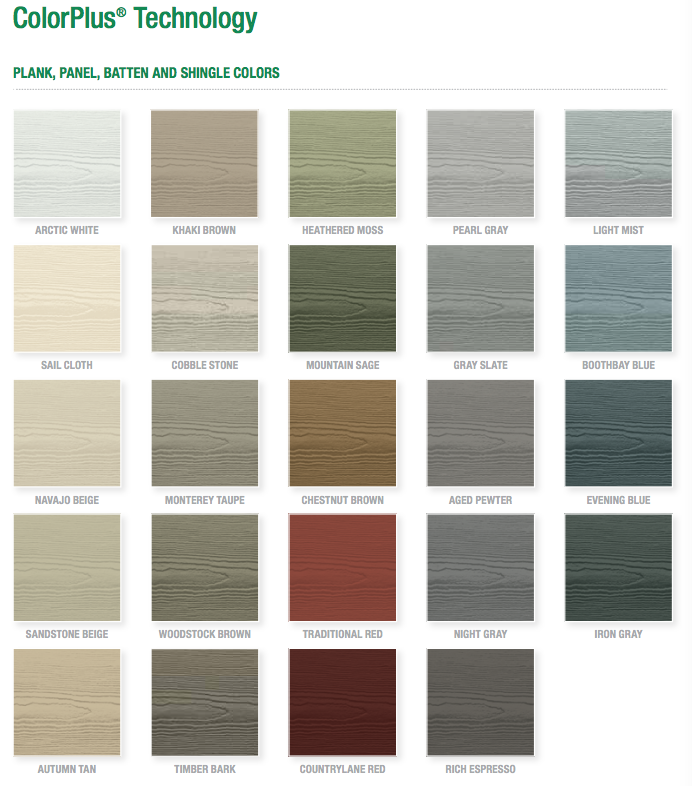 The hardi plank siding comes in 24 different pre-painted colours from the factory. It can be installed year round and looks great year after year. However, like everything exposed to the UV of the sun, it does need to be repainted at regular intervals. Hardi ColorPlus Technology finishes come with a 15-year limited warranty. We offer a number of different siding options to our clients. The first sample shows our plywood board and batten option. This is the most economical of all the choices. Duratemp is another common choice for sheds and is fairly economical. Cedar siding, whether board and batten, bevel or channel is always beautiful but more expensive. We can aslo clad your shed in hardi fiber cement siding, hardi shakes, or hardi panels should you desire. We use exterior grade doors on all our sheds, to make sure that the only things that go in and out of your shed are human. Exterior grade doors and windows keep the insects and rodents out. The first four doors are in the $300 price range, while the french doors are more expensive. We can also custom build any custom cedar door style that you would like at an additional expense. Your shed door can be keyed to the same key as your home for an addional expense as well. We use a lot of different window sizes in our sheds. It comes down to what you want and what you are using the shed for. The most common window that we use is the casement window. If there is a building component or item that you would like, that is not included on this page, don't worry we can built it into your shed!